Zach joined Homestead Roofing on September 27 as a project manager. Even though we’re just now getting around to introducing him online, we did do a feature on him in our hard-copy newsletter in November. His initial responsibilities were to help us manage through the aftermath of the huge hailstorm which hit the area on July 28. He did this by taking on the project tasks that need to be done after the job is sold and the contract is written with the homeowner. That means that he was interacting with the suppliers, the subcontractors, and the homeowners. Now, however, Zach is a fully-vetted and experienced project manager. He got thrown into the fire after that huge hailstorm and now knows how to manage and coordinate storm repair projects which include roofs, gutters, HVAC systems, windows, screens, painting, stucco, and other items. Out of all of our project managers, Zach now has more experience with all the non-roof related damage repairs. You may have already met Zach, or you may get to meet him in the future. I appreciate Zach’s zeal for jumping right in and working on projects. He has shown that he is not timid about his assignments and isn’t afraid to make decisions and get things done. This has freed me up to be able to keep our schedule running smoothly. Zach has been an asset already. Zach has an interesting background. Right out of high school, he spent two years “roughing it” on the road across America but also overseas. He even spent time in Uganda! He really loves the outdoors and especially playing in the dirt. When I met him, he owned a business called Brown’s Greens and his forte was installing vegetable gardens for homeowners. He would build raised beds and prep the soil and, if the homeowner wanted him to, he would even plant the garden plants. This is his first love. Oops! I should qualify that statement especially since Zach engaged to Brittany, with a wedding imminently approaching on May 6th! He and Brittany are also part of a band called Smith House which plays folk music up and down the Colorado Front Range. Zach’s instrument of choice for his band is the bouzouki. How many of you know what a bouzouki is? It’s like a long-necked mandolin. 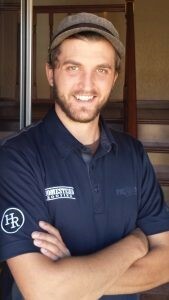 All of us here at Homestead Roofing welcome and appreciate Zach as a new team member!